‘The twelve days of Christmas’ is a nonsense Carol many enjoy singing during the festive season. It’s an obvious reference to the custom of keeping the ‘Octave’ or the twelve days that mark the celebration of Christmas each year. No one knows who wrote the words, composed the music or when it was first sung. 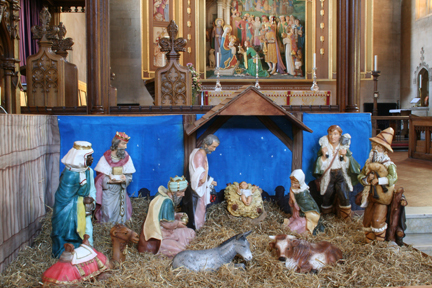 Most carol books classify it simply as Traditional English. There are, however, a number of theories about its origin. One possibility is that it began as a memory game played on Twelfth Night a few centuries ago. The players would sing a verse in turn and each would add a new gift when it came to their own verse. The catch was that they had to remember all the earlier gifts as they sang their way through the list of presents. Anyone who forgot a gift would have to pay a forfeit to entertain everyone else. This possible origin was suggested in The New Oxford Book of Carols , which claims that the version we sing today was first printed in 1864, although other versions appeared earlier. Another more popular theory suggests that it was written sometime after the Reformation, when Roman Catholics were persecuted and their worship made illegal in England and Wales. The Twelve Days of Christmas might have been composed as a covert catechism to celebrate the basic beliefs of the Catholic faith and in a way unrecognisable to the Protestant authorities. There is an obvious similarity with other Carols of the time, such as ‘Green grows the rushes, Ho’ [also known as ‘The Carol of the Twelve Numbers’], which is a strange mixture of Christian teaching and pagan cosmology. The ‘True love’ refers to God the Father who in love sent his only begotten Son to be our Saviour. The ‘me’ receiving the gifts is every Catholic Christian. This is the traditional interpretation of the Carol. 1.The partridge in a pear tree is Jesus, whose birthday we celebrate on the first day of Christmas. 2.The two turtledoves are the Old and New Testaments. 3.Three French hens stand for the three great virtues of Faith, Hope and Love. 4.The four calling birds are the four Gospels, Matthew, Mark, Luke and John. 5.The five gold rings represent the first five books of the Old Testament [the Torah]; Genesis, Exodus, Leviticus, Numbers & Deuteronomy. 6.The six geese a-laying stand for the six days of creation. 7.The seven swans a-swimming represent the seven gifts of the Holy Spirit; wisdom, understanding, counsel, fortitude, knowledge, piety and the fear of the Lord. 9.Nine ladies dancing are the nine fruits of the Holy Spirit; love, joy, peace, patience, kindness, generosity, faithfulness, gentleness and self control. 10.The ten lords a-leaping are the Ten Commandments. 11.Eleven pipers piping represent the eleven faithful Apostles; Simon Peter, Andrew, James, John, Philip, Bartholomew, Matthew, Thomas, James the Son of Alphaeus, Simon the Zealot, Judas the Son of James. 12.Twelve drummers drumming symbolise the twelve points of doctrine in the Apostles Creed. We cannot be sure about the origin of this Carol and it’s unlikely that we ever will. But this popular song we sing at Christmas might well be more than a silly party piece. It might have more meaning than we first thought!